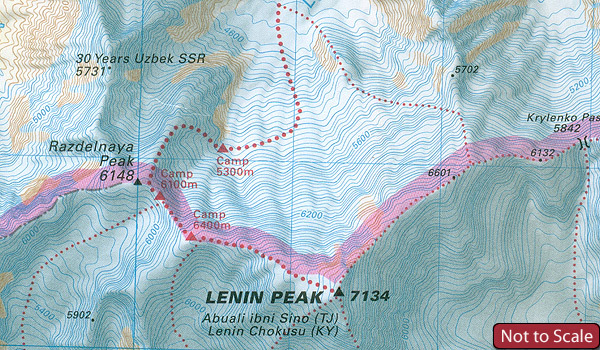 Lenin Peak, or Abuali ibni Sino (TJ) and Lenin Chokusu (KY), in the Pamir Mountains at 1:100,000 on a detailed topographic map from Gecko Maps with coverage extending along the Tajikistan/ Kyrgyzstan/border from the Dzerzhinsky Peak in the west to the Eastern Sunrise Peak on the Chinese border. In the north the map stretches beyond the Kyzyl Suu River to include the settlements of Sary Mogol, Taldy Suu and Sary Tash; coverage south extends to the Bactrian Camel Peak, Karajulga Rover and Uy Butok Pass. The map has contours at 40m intervals and numerous spot heights and names of peaks and passes, enhanced by shading plus colouring for glaciers. Climbing routes and base camps are highlighted. Map legend is in English. This is an updated 2011 edition.